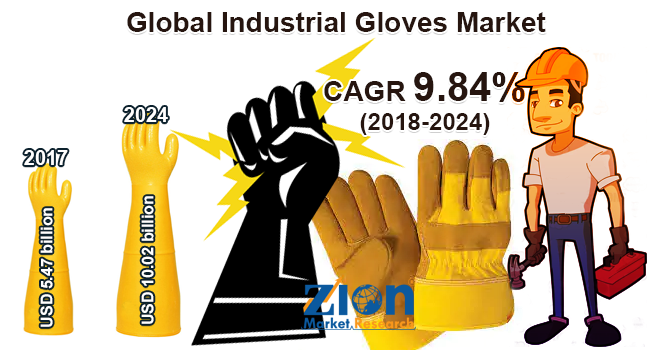 Zion Market Research has published a new report titled “Industrial Gloves Market By Product Type (Disposable Gloves And Reusable Gloves), By Application (Food, Chemicals, Healthcare, Pharmaceuticals, Manufacturing, And Others), and By Material (Polyethylene, Nitrile, Rubber, Neoprene, Vinyl, And Others): Global Industry Perspective, Comprehensive Analysis And Forecast, 2017– 2024”. According to the report, the global industrial gloves market was valued at around USD 5.47 billion in 2017 and is expected to reach approximately USD 10.02 billion by 2024, growing at a CAGR of around 9.84% between 2018 and 2024. Gloves are important to maintain a contamination-free environment in the food & beverage, biotechnology, and pharmaceutical industries. It is also necessary for the safety of workers in the automobile, aerospace, manufacturing, electric, chemical industries, etc. as hands are the main body part used for performing any action at the workplace for any work. Industrial work may have the risk of extremeness such as cold, heat, electricity, sharpness, force, and chemical. Industrial gloves are made to provide protection. Governments of almost all the countries have applied a strict set of laws and policies for the safety of workers at the workplace. Gloves are made up of natural vinyl, rubber, nitril, neoprene, etc. Growing attention towards workers’ safety at the workplace is driving the industrial gloves market globally. Increasing implementation of safety regulation for workers in the industries like automation, construction, healthcare, mining, oil & gas, petroleum, chemical, agriculture, fertilizer, food processing, aviation is anticipated to fuel the industrial gloves market during the forecast period. Implementation of regulations by OSHA (Occupational Safety and Health Administration) globally is driving the demand for the industrial gloves. The individual organization protocols for workers health and safety issues are expected to fuel the industrial gloves market. Growing industrialization in developing countries is anticipated to affect the industrial gloves market positively. The industrial process involves the physiological risk to the workers due to heat, high cold temperature, acids, chemical reagents, electricity, etc. Growing concern regarding various skin diseases and allergies associated with handling various chemicals such as itching, redness, swelling, etc. are anticipated to amplify the industrial gloves market growth. Technological advancements, product innovation, and improved quality of gloves are anticipated to boost the industrial gloves market growth. Based on the product type, the industrial gloves market is divided into disposable gloves and reusable gloves. Disposable gloves segment is anticipated to show considerable growth during the forecast period. This is mainly due to less cost of maintenance, storage, and sterilization associated with disposable gloves. Based on the application, the industrial gloves market is fragmented into chemicals, food, healthcare, manufacturing, pharmaceuticals, and others. The material segment of industrial gloves includes polyethylene, vinyl, nitrile, neoprene, rubber, and others. In terms of revenue, North America accounted for the significant market share in 2017. The North America industrial gloves market is anticipated to show a significant growth owing to high demand for industrial gloves in the region. Vast end-user industries and firm government regulations for worker safety are anticipated to accelerate the industrial gloves market in the region. Europe industrial gloves market is projected to grow in the near future owing to the expanding pharmaceutical industry; the growing semiconductor industry is also driving the demand for industrial gloves in the region. The Asia Pacific industrial gloves market is projected to grow at the highest rate owing to rapid industrialization in emerging economies like China and India. The Asia Pacific industrial gloves market is driven by the growing stringent mandates regarding worker safety in industries which is likely to spurt the growth of industrial gloves market in the region. Latin America and the Middle East & Africa are likely to achieve substantial market share during the forecast period due to growing infrastructure investment in the region. Some of the chief players have been focusing on product improvement, superior performance, research & development, and improving the quality and features of the product in order to hold their ascendancy in the market. Some of the major players in the industrial gloves market are Ansell Ltd., 3M Corporation, Holding Towa Corporation, Honeywell Safety Products, Semperit A.G. Holding, Showa Group, MSA Safety, and E.I. DuPont De Nemours and Company, among others.